As a book lover, there are few things more rewarding to me that reading an amazing book. You probably know exactly what I'm talking about -- a book that evokes intense feelings in you, perhaps even changes how you perceive your life in some way. A book that you just have to discuss with someone and see if they had a similar reaction. I've read quite a few books over the past 20 years or so that made me feel this way. Probably the one that sticks with me the most for some very many reasons is TO KILL A MOCKINGBIRD. It is without a doubt my very favorite book -- ever! I have read it numerous times starting when I was in high school; and each and every time, this novel just blows me away. If you are nodding your head right now and thinking of the book (or books) that made you feel this way, then I know of a great new site launched by Sony that will appeal to you. It's called Words Move Me: Connecting readers around the literary moments they love, and it is really a terrific way to see how readers like you have been affected by the books they've read. It's very simple to get started on Words Move Me. All you have to do is register on the site -- you need a user name and password. You can also add a profile picture, a short bio, some of your favorite books, and genres of books you enjoy. Then you can start submitting "words that move you" by creating "literary moments" from some of your favorite books. These moments can not exceed 255 characters (including spaces) -- kind of like book love tweets but with a few more characters! You can also add up to three relevant emotional tags (i.e. inspiration, humor, empathy, etc.) for additional searchability options. I have already started entering some of my "literary moments." I have to say that I had a great time reflecting on some of the books I've read and how they affected my life. Whether it be a book that I read years ago that has still managed to stay in my mind, or one that I read with my children over and over again, I think Words Move Me is a wonderful way for me to capture how much books mean to me. Besides entering some of my favorite books, I have also thoroughly enjoyed browsing the site and reading others' literary moments. It is so amazing to see the power that books have had on so many people! I think Words Move Me is just a fantastic way for the book community to come together and share the importance of the written word in all of our lives! I highly encourage you to check out the new site Words Move Me. I know you'll have a wonderful time both sharing your thoughts and feelings as well as reading about how "words have moved" other readers! And, now for the big news! To help promote the new site Words Move Me, Sony wants to giveaway a Sony Reader Pocket Edition (valued at $199.99) to one very lucky Booking Mama reader. I am so excited that I can barely stand it!!!! 1. Leave a comment telling me about a book you read when you were growing up that has stayed with you and why it was memorable. Make sure you leave an email address or a way to contact you in case you win. 2. This is not an entirely random giveaway -- I will be reviewing each entry for originality and content. I will select the top five entries and randomly choose a winner from these. 2. No purchase necessary to enter or win. Odds of winning are not increased by a purchase. 3. Sorry, but this giveaway is open to those of you with U.S. addresses only. 4. Contest will be open until Sunday, January 3, 2010 at 11:59 p.m. EST. The winner will be announced on this blog on Monday, January 4, 2010. 5. Good luck to everyone! Sony has empowered me to participate in this campaign, and I have been compensated with a Sony Reader Pocket Edition valued at $199.99. A huge thanks to Digital Influence Group and Sony for providing the two Sony Reader Pocket Editions! I guess it would be John Steinbeck's Of Mice and Men. I read it as a teenager and I guess you could say it evoked adult emotions in me as I realized that perhaps for some there are no happy endings or lucky breaks, and sometimes Life just is what it is, cruel and not very fair and that's it. I know that sounds pretty depressing, but the book has stayed with me and if anything I learned to appreciate my own little blessings more from having read it. What an interesting site and a fabulous contest! I'm not going to enter since I already have an eReader. For me, the book that stayed with me was The Diary of Anne Frank. When I read it, I was the same age as Anne was in the book and I just could not believe that someone who was my age was going through such unbelievable experiences. It made me feel as if I hadn't really lived yet - and made me realize that there was so much more to life than the four corners of my small world. I was so touched by that book that I read it about four times in a row (over a two week period), hoping and praying for a different outcome for Anne. And once it finally sunk in that it wasn't going to change, I put the book away and could not look at it again. It was too tragic. The book that has stayed with me is not a single book, but a series: Laura Ingalls Wilder's Little House books. I first read them in grade school and was swept up in the adventure of it all. I reread the series in my late teens through very romantic lenses, captivated by Laura and Almanzo's courtship. It wasn't until I read the series as a parent that I saw the Ingall's pioneer life for the tough and gritty existence it was. The many descriptions of food, the few but treasured possessions... reading about those experiences while looking at my own small daughter helped me to experience my childhood favorites on a much deeper, and more emotional level. It also makes me wonder how I'll feel when I share those stories with my grandchild someday! Thanks for hosting this great give-away! What an amazing giveaway!!!! No need to enter me, as I have a Kindle. I love your comment about Catching Fire. The kids and I just finished on audio and felt the exact same way. I would also agree with your emotions about TKAM. I listened to it on audio, which was narrated by Sissy Spacek. Incredible. I have two. The first I read in about the fourth grade. It was an edition of Robin Hood but I can't remember the author. I read that book over and over again until the covers fell off of it. I had whole passages and pages memorized. Unfortunately, since I can't recall the author's name, I haven't been able to locate that particular tale again. The other one was The Robe by Lloyd C Douglas. This is an awesome book! I read it for the first time as a freshman in high school. My family was nominally Catholic and very non-religious. This book really struck me deeply - the passion and the dedication - the overcoming of preconceived notions. I like to reread it every few years or so. Such a powerful narrative! East of Eden by John Steinbeck, no question. I've read it almost once a year since high school because it is such a moving book. One thing I love about it is the language. East of Eden carries me along as no other book does. I have said (and even posted on the internet for everyone to see) that when I read it, it feels like I am dancing, sweeping around the room carried by the words as you would be by music. If I had to pick a favorite part of that book, it would be the discussion the characters have of the story of Cain and Abel, where they go back to the original Hebrew or Aramaic word, timshel and discover that what is being said is 'thou mayest' conquer over sin. It is such a simultaneously humbling and empowering moment, and even just thinking about the beauty of the scene gives me shivers up and down my spine. The book I would say has stuck with me the most from my childhood wasn't really a book... at least, not a novel, anyway. Edgar Poe's short story "The Cask of Amontillado" was the first book I read that made me WANT to read more. I was in the sixth grade, and our class had the books with the audio recording that you sat and listened to it with the big headphones, and I was usually in trouble and had lost the privelege. And now I have around 500 books on my TBR pile, all because of that little book! lol.. Who knew? No need to enter me, darling. 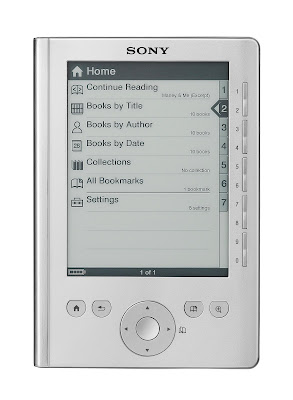 I've got an e-reader already. Thanks for the e-mail; I've got this posted at Win a Book. Catcher in the Rye is the book that has stayed with me. I love coming of age novels, and I first read this book while I was in high school. I wrote my 11th grade english term paper on it and have read it several times since then (a rarity for me). I really connected with Holden Caufield's view of the world, and his term "phonies" resonated with me. Makes me want to read it again!! THE book that has always stayed with me is the first one I read for pleasure - but that's not how it started out. When I was a little boy in 4th grade we had weekly library time. Most of the boys just played, ignoring the books even tho we were required to check one out on each visit - we just grabbed something. This particular week I was the last to "grab something", and my teacher noticed. She returned the adult book to the shelf and led me to the juvenile section where she chose a book for me. She instructed me to check it out, take it home and read the first chapter. Dismayed, I carried the dark green book to the desk and checked it out. At home that evening, I finished my homework - then stared at the hateful green book I was being forced to read. I didn't like to read! History, math, spelling - what horrors did this book hold? Resigned, I opened the hardcover book. "Chapter One...." My mother forced me to turn the light out and go to sleep an hour later; I was on Chapter Four! That green book, and that wonderful teacher, changed my life forever. I became an avid reader - during summers I would read an entire book in the morning and another each evening. The name of that book? In case you haven't guessed by the dark green hardcover and clue it was in the juvenile section, the book was one of the Nancy Drew series, Mystery of the Moss Covered Mansion. I read the entire series, along with the Hardy Boys, the Dana Girls, Trixie Belden, The Three Investigators, everything I could get my hands on! Some forty years later, I own almost all of the books in each series and still read them. The moral of my story? One book, and one wonderful person, can change a life forever! Fahrenheit 451. It was such a challenge to herd mentality, and admittedly caused a lot of problems in my family as I began to question things in earnest after reading it. F451 also ultimately led to my enduring love for sci-fi and speculative fiction. One book that I will never forget is The Old Woman and the Pumpkin. It is a Bengali folk tale and I stumbled across the book at the library when I was small, maybe 4 or 5. It is one of the first books that I remember picking up just because it looked interesting. Mom read this book to my sister and I all the time. Mom was the best reader because she always did voices and if a character sang in the book, as they did in this one, she made up a melody that went with only that book. This book will always make me think of security, of the feeling of being tucked in bed with mom and sis and knowing that everything would be ok. Another thing this book taught me, is that you never know when you might find a treasure. Because of this, I love browsing libraries and book stores just to see what I might stumble across. My 7th grade English teacher gave us a wide range of books to read - including 'Farenheit 451', 'To Kill a Mockingbird' and so many more. While these books all stay with me today (in the form of much-read and beloved volumes on my bookshelf), the one that made the biggest impact on me was the smallest volume - 'Anthem' by Ayn Rand. I had never read anything like it before, and it opened my mind up to the magical worlds that waited for me in the pages of books. The book that moved me as I was growing up bar none was Louisa May Alcott's Little Women. It's the first novel that I remember reading that was not part of a school assignment, but just for reading pleasure. The words, the world, the family, the failures and triumphs, not to mention the love. I love the magic of Jo's writing and how it captured her family and her imagination in such a turbulent time in history. It was the spark in the fire that began my reading obsession. I love to read, and I think in large part it is due to reading such a great book as my "first". I now try to inspire reading in anyone who sees reading only as a chore, not the joy in discovery it can bring and enrich your life with. I love Sony's new "Words Move Me" site. I've used it several times and love posting my favorite quotes from the books that I read that I feel encompass the best parts of the book..hopefully to inspire someone to pick it up and read it. Thanks for hosting the contest and spreading the word about "Words Move Me"
At age seventeen, I chose George Orwell for an English term paper and "1984" has stuck with me all these years. It was topical because that was the year of my graduation (you're doing math, aren't you?) and I wanted to get out of my comfort zone a little. It was sci-fi, a thriller, and political and made me like about how far literature can affect our world. I love that it is on the required reading list at my kids' high school! When I was in the third grade, my grandma gave me a book for my birthday. I was delighted because this was my first hard cover book. It was Charlotte's Web which I have loved my whole life. I loved the story about Wilbur and Charlotte, the illustrations by Garth Brooks, and the feeling of love from my grandma. The theme of friendship and sacrifice and the beauty of words will stay with me forever. What a great idea! I have two books that continue to stick with me through the years: Anne of Green Gables and Rebecca. My favorite quote of all time is from Anne of Green Gables: "Isn't it nice to know that tomorrow is a day with no mistakes in it yet?" What a powerful and profound idea to discover as a preteen! My second favorite book is Rebecca by Daphne du Maurier. I can find myself empathizing with the second Mrs. de Winter - so much so that when my book club read it a few years ago and berated her for her weaknesses, I got more than a little upset. Mrs. de Winter may be weak and mousy in the beginning but one of the best parts of the book is watching her discover her inner strength to stand up to the ghost of Rebecca and defend her position as Maxim's wife. I always enjoy watching her transformation and liken it to my own as I grew from a weak and insecure teenager to the powerful woman I am today. Both stories help transform me and my outlook on life. A book that I read growing up that has really stayed with me is Through the Looking Glass by Lewis Carroll. I have distinct memories of reading the book and being completely awed by the world in the Looking-Glass--I can even remember the musty book smell of the library book I was reading at the time. I was so awed by that book. It helped me keep picking up books that were outside of my usual reading fare (which at the time consisted largely of books about horses LOL). I read so much as a kid, and have so many favorites. One that has stuck with me and influenced me the most is the Anne of Green Gables series - all of them, though Anne of the Island is my favorite (Philippa is such a hilarious character!). Anne taught me to be a dreamer, and whenever I get too involved in the stresses of life, I try to think like Anne did. :-) There are so many things you can take from her and look at life in a fresh, new way. So many wisdoms... L.M. Montgomery must have been an amazing woman. When I was a teen, I read To Kill a Mockingbird because I had seen the movie a number of times. The book was amazing - written through the eyes of an innocent young girl, you're taken to a town in the south where prejudice is just part of life. It's not just Tom Robinson's story that moved me. I was moved by all of the small stories in this sleepy town particularly the one about Boo Radley -- a man who would be handicapped by today's standards, but back then was labeled a madman. Scout's outspokenness and blind faith is something I still cling to. She didn't care about a man's color or where he came from. It was what a person did with his life that mattered, be it a small thing like giving a toy to a child or a large thing like saving a person's life. Years later, I became a teacher. I worked in a town where the people were well-educated and God fearing and still I heard them speak out against a Korean boy who didn't understand English and another refer to a classmate by the "n" word. More than 50 years after Harper Lee wrote To Kill a Mockingbird and still people were judging based on the color of another person's skin. It saddened me but it also made me want to keep on working to make a difference. That's what words have done for me. I was sixteen when I read The Great Gatsby—sixteen, therefore, when my whole, nascent writerly world shifted and I understood that language was bigger, more empowering, more hypnotic than I'd recognized it to be. I'd been writing poems. I'd already seen myself as a writer (or a girl who wanted to be one). But Fitzgerald (Gatsby) was this whisper in my ear. Fitzgerald (Gatsby) was: Beth, there is more. Beth, pay attention. I think the first book that I fell madly in love with (that I can remember at least) is The True Confessions of Charlotte Doyle by Avi. I remember wanting to discuss nothing else. I actually had a lunch date with the principal of my elementary school and we were supposed to discuss one particular book and I asked if I could talk about Charlotte Doyle instead. I'd always loved reading, but this was the book that made me realize how truly amazing books can be. When I was a child I read voraciously (I still do as an adult). I would read while walking the half mile home from school, I would read during my free time, and while I was supposed to be doing other things. My father introduced me to science fiction and fantasy at a young age with J.R.R. Tolkien's Hobbit and The Lord of the Rings Books. I still reread them almost every year as an adult. But the moment which sticks with me most was the time I was reading The Two Towers for the second time. We had gone as a family to see the Chicago Symphony Orchestra play at a free concert in Grant Park. I was sitting reading my book as the music played. Right as I got to the most climactic part of the book, as Golem leads Sam and Frodo up the stairs past Minus Morgul, the symphony launched into the fanfare for the common man by Aaron Copeland. It summed up the emotions I was feeling, the suspense of wondering if the Hobbits are going to be seen above the army leaving the ruined city, and the elements of danger facing them. I was stunned. To this day I try to get this music piece playing as I read, and have never been able to get it to match up so perfectly with the book. It was a magical moment that helped my imagination envision the story so much more intensely. One book that I read when I was a child was A Solitary Blue by Cynthia Voigt. The relationships between the main character and his absent mother and the one he had with his father were very different from what I experienced, and I remember really feeling for the character and his situation. The first books to stay with me were the Laura Ingalls Wilder, Little House on the Prairie books. I gobbled these books up. The innocent adventures the family would have, how they stayed together and loved each other no mater what, and treat everyone with respect. It reminded me of my family because these are things I was taught growing up by my parents. I easily pictured me and my family in these books. You may not have much, but you always have your family. The second book would be The Yearling. This is one of the first books that really made me cry; like sitting there on the couch all out bawling. I haven't read it since because it made me so sad. Just thinking abou it now, brings right back to that day (shiver). and the third, because I can't leave these out, are the Nancy Drew mystery books. It may sound corny, but I loved the sense of adventure and mystery with these books. Whenever I went to my Aunt's house, I would bring a handbag with things I might need in case I discovered a mystery that needed to be solved. I think that's why I have a sense of adventure and will try just about anything. My favorite book when I was young was The Once and Future King. The writing is lyrical,and I loved the humor. I loved how Merlin called King Arthur 'Wart' as a child, to keep him humble. I loved how Merlin wasn't perfect, and sometimes his spells went awry. It taught many life lessons, woven in through the prose and it is still on my bookshelf. I re-read it now and again. It is a timeless piece of literature. Thanks for the Words Move Me site, I went and registered. One of the books that has meant a lot to me is To Kill A Mockingbird by Harper Lee. I was a gawky clumsy tomboyish tween and teen and Scout was similar but with verve and a way of envisioning the world that was both individual and insightful. The scene where the boys are peeing off the porch in arcs of urine and she couldn't do it because she's a girl has stuck with me all these years. And she showed an adult compassion to Boo Radley that mirrored the compassion her father showed to others. And thank you for your site, I have read many of the books, or at present they are on a pile or on my list. What a great give away! I especially love the topic and it took me a moment to choose between all of the books that have affected me so much over the years. I guess if forced to choose I would have to go with 'the entire Harry Potter series' but specifically the first one, where it all began. Not only has the HP series been the inspiration behind our book blog, but it has also been a driving force in my personal life. For the past 9 or so years I have laughed, cried, sobbed, and even thrown things over Hp series. When I first began the books I was quite young and knew only that the story I was reading, was one that made me feel comfortable and sparked my imagination, something I think most authors hope to accomplish in children. Through the 7 books I have become incomparably attached to the main characters, dreaming and hoping with them, even holding my breath in times of their crisis. The happiness and the loss that they felt, I felt as well...as did thousands of readers all across the world. Even though it has never been my burden to rid the world of Lord Voldermort, I have felt the tragedy of being a teenager, a time that Harry and his books definitely helped me though. The end of the series, and of Harry Potters story honestly brought forth the feeling of loosing a best friend. One that I have shared so much time with and who will be greatly missed. Good luck to everyone in the contest! I hope your choices have touched you as much as mine touched me. I spent a lot of time thinking about which book to choose, and whether or not to share something on the Internet that was so close to my heart. After reading everyone's comments, I knew that I had to choose this particular book, because it affected me in such a way that I will never forget it. The book is Thirteen Reasons Why by Jay Asher. I read it when I was a junior in high school (I'm now a sophomore in college), during a very difficult time in my life. I was having a lot of issues with depression, and my best (and only good) friend was anorexic,to the point where it was threatening her health both physically and emotionally. We were growing apart, and no matter how hard I tried, I felt like I couldn't stop it. There is nothing so completely demoralizing in the world as the feeling of total, complete helplessness. I was so incredibly terrified that she would leave me, and I would truly be alone in the world...even more alone than I had felt at that time. It's hard to admit, but I did think about suicide a few times. I had had problems with self abuse when I was 14, and while they disappeared for awhile, they resurfaced at this time in my life. Books had always been my refuge, but I was getting to a point that not even they were helping me. That is, until I picked up Thirteen Reasons Why. For those of you who don't know much about the book, it's about a teenage girl who commits suicide, then leaves a series of tapes behind explaining her reasons for doing so. Aside from being one of the most compelling books I've ever read, it touched me at a time in my life when nothing else could. There's a scene at the end of the book where the main character, realizes that if he would have confessed his feelings for Hannah, or at least let her know that he wanted to be her friend, it might have been enough to keep her in the world. It's a beautiful, heartbreaking scene, and it taught me a new value to life that I hadn't seen before. Even if I never knew it, if my being kind and friendly to someone could be enough to save a life, my own was worth living. That realization did wonders for me, and throughout the next year, I was able to turn my life around with the help of my family and friends. A Wrinkle in Time. I am Meg, I thought. I ended up reading WIT ten more times, including every year to my fifth graders as a classroom teacher, once to my sons, and several times as personal rereads. I never win, so I am only entering because I desperately want a Sony eReader....Mercy! I am channeling Meg here. That's what happens when you read a book eleven times. My parents divorced when I was five, but they were both very avid readers. Not a weekend went by that we weren't at the library or bookstore or both. I would have to also say that To Kill A Mockingbird is the book that has meant the most to me. And the one I have read most often than any other. When I was younger, I very much identified with Scout. I wanted Atticus to be my father. I wanted Dill as my neighbor. I wanted my brother to be like Jem. So many layers to the book. So many memorable parts. Shooting the rabid dog, the mob outside the jail, reading to the morphine addicted neighbor, Boo (everything about Boo), the hate, the love, the bravery, the forward thinking on Harper Lee's part. And the part where Atticus walks out after losing the trial and everyone stands. Tears, every time. Tears now just thinking about it. I loved the book so much, I named my firstborn daughter Harper. Ok, I'm not sure if this counts, since it was actually read to me, but...when I was little, my mom would always read "Love You Forever" by Robert Munsch and Shiela McGraw to me and my brother and she would get all teary eyed every time. We never got why she cried, but we loved having her read the story to us over and over. Well, my first year teaching Kindergarten was five years ago, and I pulled out this book to read to my students for our Mother's Day Theme. And all of a sudden I got it! And this time I was the one who became teary eyed and I still do every year when I read it to my students! I loved Little Women. I read it often as a young girl and many times as an adult. Sharing it with my daughter made me love it even more. The book that immediately springs to mind is "So Young To Die" the story of Hannah Senesh, who was a Jewish resistance fighter during the Holocaust. It was one of the books that triggered my interest in that time period, and that interest has led to my current career in documentary theatre. I think it's great when a book can influence a person like that. Reading about Jo March's world of words and imagination as a teenager, gave me a sister--and a mirror. While her sisters were interested in friends, boys, clothes, and dances, Jo thought of books and characters. She lived big in her dreams and yet never forgot her family or her duties. "Little Women" told me what I wanted to do with my life - be a writer. Jo's story led me to read biographies of Louisa May Alcott and make her my childhood hero. Now, as a writer of fiction, I feel even closer to Jo and Louisa. And when my book is published, I know I have those early proddings while reading "Little Women" to thank. The #1 book I read as a child that has stayed with me is Goodnight Moon. I can never remember who wrote it...but I love that book. The artwork is beautiful. It is a simple book but there is something so comforting about it. When reading it outloud it's almost like you start out speaking normal and the closer you get to the end the softer it must be spoken as you finish saying "goodnight" to everything. I hope that one day when I have my own children, they will love it as much as I do. I've already bought it as a board book for my niece. When she gets old enough to read on her own I will most likely buy it as a paperbook (whether paperback or hardback--doesn't matter). Wow! So many interesting books and experiences I'm sure it will be hard for you to narrow it down to finalists. The book that influenced so much of my life is Burr by Gore Vidal. My high school English teacher recommended it to me, and I was fascinated by this book that turned our founding fathers from icons in my mind into real people who were flawed. It changed the way I thought of history and launched a life-long love for me of Gore Vidal's books as well as of historical fiction. Through his historical fiction I've learned about American and world history. His other novels are wickedly satirical, and his essays encourage critical thought. The best part of all though, is that my daughter also shares a passion for history. As we have read Vidal's American history novels together (there are seven and we're finishing the sixth), we have been able to share conversations about our country and our own political beliefs. As she started college this fall (majoring in history) the time we spend together in conversation has become very precious to me. While Vidal's stories are fictional, they often contain the exact words of historical figures taken from their own writings and woven into his story. His books are a great starting place to find out more about the actual people and events that helped shape our country. Great site. Words do move me. Okay, I am going way back. Make Way for Ducklings! I loved that book when I was little, I was always reading it or begging to have it read to me. In fact, I still have it and I am 52 years old now. This book was followed up by my second favorite book, Stuart Little. I still have that one as well. This is actually very hard for me but I would so love to win this Reader. I have been aching for one for so long. The reason i say this is hard for me because there are so many books I have read as a child that just stood with me and actually helped me understand and get through some times in my life. One of my favorite authors, S.E. Hinton and I think all of her books had a great impact on me. I could definitely read those over and over again. I also loved John Steinbeck. I read many of his books before they were required reading. I also love Ayn Rand. I don't side with her on many views but I would get so engrossed and understand why she had the views she did. I think I will have to go back further though and choose an author and book that made a real difference in my life. I have to choose this book because when I started reading Judy Blume I was probably only about 9 yrs old. The books were Fudge, Otherwise Known as Sheila the Great, and Tales of a Fourth Grade Nothing. Those books are what made me love Judy Blume in the first place. When I started 6th grade I found Are You There God? It's Me Margaret and that book helped me so much. My mom wasn't the type to explain things to us about puberty and at that time Health class spent one day on the birds and the bees. We were apparently lucky we got a solid day of it. Oh, & that was a class where the boys went in one room and we had to be taught in another. That book walked me through my feelings, helped me relate to what was going on with me as a young girl and helped me to understand what would be happening soon. Shortly after reading it I did cross over (as they say) and I wasn't scared or worried even though my mom never discussed "womanhood" with me. I wasn't upset or sad. I went to her bathroom and collected my necessary supplies and later that evening I told my mom. She went flush and paused. Then it was a lot of words fast and "...did you find what you needed?" and that was it. If I didn't have Judy Blume at that time I know it would have been a much different experience. I remember later on being so upset when they were trying to ban her books from the schools. I don't know, of all of the classics like Little Women and literary greats such as A Tale of Two Cities and even my love of SE Hinton's Rumble Fish, That Was Then This is Now, The Outsiders, and more; this Judy Blume title is actually the book that truly sticks with me to the core as my own young daughter is coming up. I am grateful that there are authors like her out there and I am very pleased to know my daughter also found her books and loves them as much as I did. I hope I win the Sony eReader and have the ability to then carry all of my favorite titles with me everywhere I go. Thx for offering this contest. What a fun contest! It really got me thinking. Not about what book(s) I would choose (no question there), but about how I would explain my feelings. Like so many others, the Little House books by Laura Ingalls Wilder are the books that have stayed with me. I not only read the series over and over again, I was consumed by them. They became a part of my life. When I was younger, I romanticized the Ingalls' way of life. Their love, hard work and pioneering spirit seemed to draw me in. I re-read the series over and over and as I matured I was able to fully appreciate some of the hardships that Laura's family experienced, still with a deep love and devotion to each other. Laura's stories helped shape who I am today. I am still consumed by her stories, but in a much different way now. I am in a never-ending quest to learn more about the real Laura. I remember reading Flowers in the Attic as a teenager. It was the first book that really got my attention and made we want to read the whole series. After high school I stopped reading, it was not until I was invited to a book club did I rediscover my passion for reading. Thanks for the contest, and have the most blessed New Year! In Cold Blood is a constant memory for me. I think it was the first grown up book I read in 1966. I was so proud of myself but I had no one to talk to about it because none of my friends parents would let them read it! I was horrified, and strangely enthralled. It evoked more emotions than I knew how to deal with, but it also showed me that books are more than just words on a page. They can take you to places you would never go and show you people you would never meet and lives you would never lead. "A Little Princess" by Frances Hodgson Burnett. I remember the experience of reading it so clearly. I received it as a Christmas present from my mom (books were a common present for me growing up) and although I LOVED to read, prior to this book I stuck to "fluffier" stuff. I was intimidated by the book when I received it because it seemed so thick to me at the time, and it was the closest to a "classic" I had ever gotten. But when I was finally brave enough to being reading, I was immediately enthralled in the story. I've re-read the book several times, and still have my original tattered copy. The book taught me to love "tougher" reads and the sense of accomplishment that comes with finishing one, and from that lesson, I have found the other books that have in turn changed my life. Bridge to Terabithia was the first book that made me cry. I'd found it on my older brother's bookshelf, and he warned me that it was a weepy one. A 17-year-old boy admitting to his little 10-year-old sister that a book could cause tears! I knew it had to be good. Of course, it was. Jesse and Leslie's friendship is timeless, and I think the book must continue to blow the minds of fifth-graders with the realizations that your friends can die and kids your age can die. I think Katherine Paterson taught me the meaning of "bittersweet." First, I want to say what a grat idea for a website. I'm totally joining. Paco's Story by Larry Heinemann demonstrates how the Vietnam War impacted draftees and the difficulty they had assimilating back into their normal lives. It is horrifying, paralyzing, and sad. Paco is a complex character and his story is etched into my mind. War has never been made so real for me, and this novel should make our lawmakers think twice about war. I learned to read very early, thanks to my Mother, who read to me from my Dad's Army bible, and my love for reading has always been my favorite pastime. In first grade, we went to the library and I was so excited I could hardly choose a book. I came home with "Little Black Sambo" and now own a copy, that I have read to my children growing up and now my grandchildren. I was just fascinated with books, and learning about new places and people. As for inspirational, I have to say Robin Jones Gunn's book, "Gardenia's For Breakfast". This book touched me in so many ways, and many others I have given copies to. It is surely a blessing to have so many gifted authors to inspire us and provide us with so many pleasurable hours of reading. I would love to be entered in your giveaway for the SonyReader. 'Over his shoulder I saw a falling star. It was me.' is my most favorite line ever out of a book. It comes from Falling Angels by Tracy Chevalier. From the moment I first read those sentences, I was captured forever. The power behind what Chevalier wrote hit me, because it was in reference to a young girl's death after she is grabbed by a man in a crowd of people (who are either oblivious or uninterested in helping her). How could you not be affected by that last and final thought from a child who knows her time on this earth is about to end? I keep a copy of the quote on my desk as a reminder of the fragility of life, especially for the young who are unable to protect themselves. Blubber by Judy Blume as a kid I remember how mean I was to another girl after reading it I felt bad and I apologized. Judy Blume really made an impression on me and the second book Are You There God? It's Me, Margaret, I really could identify with Margaret because I grew up with no religion. I picked up a copy of most of Judy Blume's books for my daughter so she could enjoy them. This question is really hard for me - I have been an avid reader since I was very young. I always remember my mom and/or dad tucking me in at night with a Little Golden Book. I especially loved Grover's Own Alphabet and remember that when I got to have that book before bed I would try to do all the crazy alphabet moves that Grover did. Little did I know, I was doing yoga back then!! I still love that book to this day, and have used it with my students when I was working in a pre-k class. The Chronicles of Narnia by CS Lewis are the first books I remember being read to me as a child. My brother and I not only played Narnia in the backyard for years, we even made up our own make-believe worlds (Gondalen and Megaphon). Not only did these books unlock our creativity and imagination, they also initiated a love of read and of being read to - something I plan to continue with my children. If I'm lucky enough to snare the e-reader it's a surprise for our teen, who will be headed off to college far away from us, this yr.
She made me smile & hug her last week by picking up one of the Holiday books she had placed on our coffee table & asking me to read it to her on the sofa as we had as children. It was Stella Ormai's "The Animals Who Woke Up For Christmas" & I did my best to voice each character differently, as I had so much fun doing (on this same soft brown sofa) when she was a kiddo (three or four moves ago!) But that book wasn't around when I was a kid. Last year she began reading to me choice passages from J.K. Rowling's pen (HP). But that series wasn't around when I was a kid. The one book that left a lasting impression on me when I was about eight, was OZMA of OZ (accept no substitute, such as The Wizard of OZ) by L. Frank Baum, with drawings by Denslow. It was a hand me down of great potential, from my stepgrandmother. In this book Dorothy & Ozma, a strong but kindly queen, are each center stage, together & apart. It was filled with fantastical creatures such as the ugly scary Wheelers & a generous tree that gave travelers in strange lands tidy lunch boxes & a room where Ozma changed her heads to suit her mood! In the underworld the Gnome King was defeated by Ozma & her batillions through strategic use of an unlikely weapon from the kitchen. I won't spoil things but do check it out from your library or favorite bookstource. Accept no substitutes from the land of Oz! OZMA of OZ rules! Happy Reading again & again, in 2010. My mother wasn't able to talk with me about the changes my body would be going through, but she knew enough to give me a book that captured all of my anxieties and excitements. I have never forgotten Blume's honest prose (who knew people wore pads with belts?!) or the ways it calmed my fears. I read and reread it over the next few years. My own daughter is 8 and I can't wait to re-read 'Are You There God' with her. This time there will be plenty of conversation, too! My father gave me a copy of Aesop's Fables when I was a little girl and although I didn't quite understand the story behind the story, I loved reading about the little animals every night as I lay in bed. I read that book over and over as the years passed and with each read, a new perspective on the tales of the "cute animals". I'm over 50 and I still have that book, it has survived two marriages and countless moves, but remains dear to my heart. The book I read that was memorable for me was 'Where The Red Fern Grows'. It is memorable to me because it taught me to work hard for what you want, plan to make your dreams come true, determination to keep working at it, patience to teach and lead, love and passion for your dogs and hobby. The book did a great job painting a picture with it's words and enjoyed every word of it! Thank you & Sony for this giveaway! Old yeller- I remember it being very sad when the dog had to be shot and I remember my 4rth grade teacher reading it to us in school. The premise was very interesting - it not only had teenage wizard main characters, but it also had wizards who were whales and dolphins, who performed spells by singing. My memories are a bit fuzzy, but I believe that the whale wizards were performing a "play" that they did every 100 years or so that slowed down the entropy of the universe. The teenage wizards agreed to help out, and one of them (Nita) took a role in the play. The thing that impressed me most as a teenager was the very strong sense of responsibility that permeates the book - that the wizards must perform their duty in order to protect everyone and slow down the eventual death of the universe. Even to the point of knowingly sacrificing themselves to fulfill that duty. There were also random scenes that were very memorable, like a shark's explanation of how he ended the pain of others, and a description of a spell being said faster and faster, like children competing with each other to say the Pledge of Allegiance. The ending - in particular one character's sacrifice - probably struck me the most. Wow, I loved that book. I think it's time for a reread. Thank you for the giveway! Goodnight, Mr. Tom by Michelle Magorian. I first read it at age 8; it was handed to me by my very favorite teacher with the words, "I think you'll enjoy this." As an adult looking back, I'm somewhat surprised that I adored this book at such a young age, since the book deals with some very heavy themes (serious maternal child abuse and neglect, evacuation during World War II, etc.) Oh, but how I love that book. I've read it at least once a year since that initial reading (which was 19 years ago), and have worn out two copies. Clearly Deb knew something about my little soul when she handed me that book. And now that I'm a teacher, I strive to do the same: find a book that will resonate with the child before me. The book is considred by many to be simply a child's book. But to me, Black Beauty was and is a gateway to a whole world of adventure. I came to my Nanie at just 6 months old... she was 51. She first read Black Beauty to me when I was four. We would read it every summer and every time I was sick. I longed to hear about Ginger and the Fox Hunt, the runaway horse and how Black Beauty nearly died but lived to tell another tale. I read that book to my daughter and I still pick it up every few years and transport myself back to my Nan's loving arms and the mysteries of her voice as she mimicked each charachter. Black Beauty lives on -- he will never leave me. I can't pick just one book that has stayed with me from childhood. I love to read and my parents encouraged my reading from an early age. I do have a couple of favorite series though. I would read these books and be transported to another time. The first is the Little House series by Laura Ingalls Wilder. I loved those books and have them tucked away for my daughters when they start to read on their own. The second series that I read was Little Women and the others in the series by Louisa May Alcott. I loved those stories! Next were the Anne of Green Gables books. I loved reading about Anne and her adventures. These books are also tucked away for my daughters when they get older. Last, I loved reading about Nancy Drew. I loved trying to figure out the mystery and seeing if I could figure it out before she did. The one book that I read in junior high one summer was Gone with the Wind. I enjoyed reading about another time in American history. The book seemed to come to life as I read it. I read GONE WITH THE WIND thirteen times, prior to the age of fifteen. I grew up in Atlanta, and the town had a an immense sense of pride in the author, Margaret Mitchell. Her love of that period history comes out in her poetic prose. And of course the story -- of unrequited love -- is timeless. Today (and even in my 'tweens) I'd wince at Scarlett O'Hara's attitude toward slavery, but it aptly reflects that of gentried Southerners during the time in which the story takes place. Thank goodness, we've come a long way since then. The book or should I say books that have influenced me most have to be the Nancy Drew series by Carolyn Keene. I can remember being elementary school aged and reading all of the Nancy Drew books in my library at school. I have always loved a good mystery, I guess. Our librarian was kind enough to borrow books from the high school library to feed my need. As an adult, I enjoy very few TV shows. I am a huge fan of NCIS and CSI though because I want to figure out who did the crime. I hadn't really thought about it until you posed your question, but I guess my love of Nancy Drew, and a good mystery, has shaped my TV watching habits as an adult. I do tend to gravitate toward shows that seek the truth - be it a mystery illness show on Discovery or a crime on NCIS. One of my favorites from childhood is The Bobbsey Twins. It was always an adventure going to the library with my mom and picking out a new book in the series. I also loved Little Women and all the biographies of famous ladies like Dolly Madison and Julia Todd Lincoln. Being able to read a book opened a gate to other worlds that I could only dream of. I grew up in the South, right outside of Memphis. I have brothers. There were four of us under five at one time. When our ages ranged from about 8 to 11 our mother bought us two books: For Boys Only and For Girls Only. We swapped them immediately. The first book I recall deeply, profoundly affecting me as a young reader was Paul Zindel's The Pigman. It's about a couple of kids who decide they want to play a prank on an old man in the neighborhood and maybe try and get some money from him, but they end up befriending the man instead. He's an eccentric guy who collects pigs - something he started because of his wife, who has died. They don't find that out until much later, but it's an especially poignant story because it's about these three complete misfits who end up spending time together and how it changes them. I remember there was a story with The Pigman that Mr. Pignati (a.k.a The Pigman) told the two teen characters with a question at the end that was designed to tell what they were most preoccupied with in life. I remember going along with the story and answering the question myself and it was interesting to see how it came out. I believe I was supposedly preoccupied with magic. One book I read as a young adult was "The Hobbit" & it stuck with me because of the fantasy of it all. I think it was at that point that escaping into a world of imagination became my most enjoyable reading experience. I went on to read "The Lord of the Rings" trilogy as an adult & enjoyed it as much as "The Hobbit". Christopher Moore's "The Gospel According to Biff." I've tried to read the Bible without much succss in making sense of it. This book clarified it all to me. Truly one of the best books I have ever read. I really always enjoyed Madeleine L'Engles books (A Wrinkle In Time, A Wind In The Door & A Swiftly Tilting Planet). These were GREAT books! They are a science fiction series that I found very approachable as a young reader. I really enjoyed her writing style. I remember always liking books that included fantasy in the story and found that reading these books grew my capacity to think outside the box. Which brings me to my equally favored The Chronicles of Narnia by C.S. Lewis. How amazing these stories were! These always gave me such a sense of hope during hard times. It showed me that while trials come, hard work, loyalty, faith and determination will always take you down the most satifying road in life. To this day I read them often and always gain such a significant reminder of this truth. I look forward to reading through them each night with my little girl (she's 2 now so I'll have to wait a bit!). My husbands father read Lewis' books to his 4 chidlren every night and I look forward to doing the same with mine!! WOW! I am SO looking forward to sitting by my kids beds and reading them these books! I'll do all the voices and we'll just create memories! It'll be great!